What’s cool one day may be “so last season” the next. And that doesn’t just go for shirts and shoes. We’ve got your association and non-profit round-up of what’s passé and what’s here to stay (at least until next year). Ok, your cause is still important. But being able to show how that cause helps create jobs is even more important, especially for organizations that rely on government funding for themselves or their industries. As government at all levels has looked for ways to cut spending, more organizations are emphasizing their role in job creation. We’ve seen many industries commission studies on their economic and workforce imprint, and others making jobs the focal point of their lobbying efforts, grant proposals, and general messaging. Need further proof? 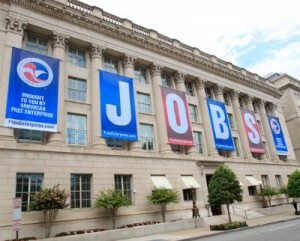 Just look at the giant banners outside the US Chamber of Commerce.